Looking for a quick escape perfect for everyone in the family? 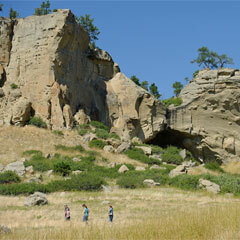 Check out Pictograph Cave, just right outside of Billings. Prehistoric hunters once lived in the caves. The caves feature approximately 100 rock art paintings. 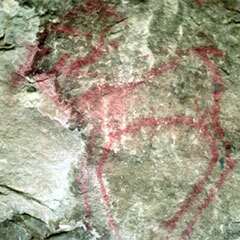 The pictographs depict animals, warriors and rifles. Over 30,000 artifacts were also excavated from the area. The Pictograph Cave has been designated a National Historic Landmark since1964. Visitors can explore the three main caves by walking along a quarter mile loop trail. Bring binoculars to get a close up view of the pictographs. After checking out the caves, bring lunch and relax at the picnic facilities. Photos courtesy of Montana State Parks.